Mie of Sewing Like Mad has a fun series going on - Sewing for Kindergarten. I don't have a kindergartener this year so I don't qualify. However, she was kind enough to let the rest of us join in by creating Flickr groups for different ages, from pre-school through high school. Utter cuteness has been uploaded and of course made me want to sew for my kiddos. The fabric came from my stash. I bought it on line a while ago and the color looked salmon on my computer screen. Well, it is not salmon, it's pink, dusty rose pink. I didn't like it, but somehow I love it here. The fit is perfect. I love Ottobre patterns because if you use your child's measurements it will always be a perfect fit. Hey... Where did my previous comment go?? Oh well, just wanted to say I loooove it and it also looks super comfortable!! Did the cup survive? O, so British :) afternoon tea party! I actually like the color and the pattern very much (love for nice tea cups run in the family). I also realize that it reminds me of that pink polka-dotted dress you made for Evelina? Does it mean I start understanding the intricacies of sewing patterns just a bit? :) overall, lovely dress for a little lady! I just discovered the amazingness that is Ottobre. Why didn't anyone tell me earlier? also, I love the tea cup fabric! adorable! So adorable! I love the look the pleats gave it. I'm dying over this fabric!! What a lovely outfit :) Def not salmon haha but of so cute! love it! 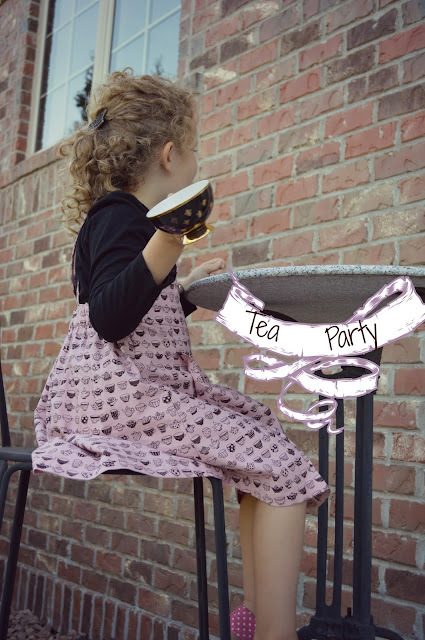 The tea-time fabric is adorable!